Do you need to reclaim family meal time? Check out this clip. I love technology. I love the things it can do, the way it makes our life easier and more interesting. I love the way it can be used for teaching and learning. But, I don't love technology when it takes over important family time. We don't need to get rid of technology, but it is worthwhile to tame it back so that our children and teens can develop the skills necessary to be happy, productive members of our world. 1. First thing in the morning. Technology use should come after other important things are done. Do not let it keep your children from being ready for the day. After they are dressed, school supplies gathered, and have spent some quiet time reading a book or devotion, then the technology can make its first appearance of the day. 2. Mealtime. 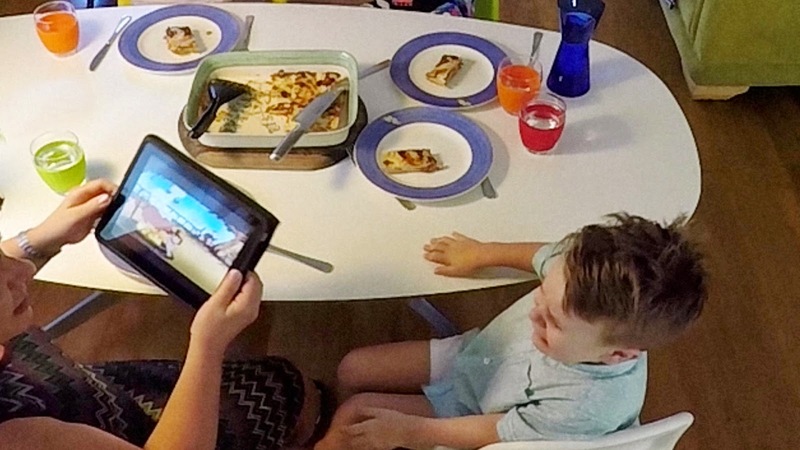 At least one meal of the day should be family time without technology (that includes television). Mealtimes are important opportunities to share stories, to learn problem-solving skills, to learn social skills and to share faith. These skills cannot develop if they are interrupted by games, commercials, calls, texts, or Instagram messages. 3. Bedtime. Technology use right before sleep can make it difficult to fall asleep. When the phone, tablet, or television is turned off, the brain can begin to process the events of the day. Bedtime also offers a unique time to check in with your children or teenager. A quiet bedtime conversation can often reveal what weighs heavily on the mind. Even fifteen minutes to talk and pray with your child will give a strong message that you are available. Allow yourself some time to rest from technology. Especially if that time is spent with family and in faith sharing.